More than half of voters oppose abolishing ICE, while just a quarter support abolition, a new poll found. 54 percent of respondents to a new poll from Politico and Morning Consult support keeping the federal immigration enforcement agency. But 43 percent of Democrats want to abolish the agency, while only 34 percent want to keep it, in stark contrast to the opinions of Republicans and independents. ICE abolition has taken off as a proposal among Democrats in recent weeks, with prominent party figures like Sens. Kirsten Gillibrand (N.Y.) and Elizabeth Warren (Mass.) backing it. ICE abolition's rise in prominence was driven by Democratic Socialist Alexdria Ocasio-Cortez's upset victory in New York's 14th House district primary — Ocasio-Cortez has backed abolition in her platform. Now, the issue has become front and center even in state-level races, like Governor Doug Ducey's (R.) reelection bid in Arizona. It's still unclear what ICE abolition means. A bill enacting the proposal, from Rep. Mark Pocan (D., Wisc. ), is expected in the near future. But an op-ed from the Congressman explicitly punted on what, exactly, would replace the nation's interior immigration enforcement force. Whatever the proposal is, the Politico poll suggests that it may be popular with Democrats, especially young ones. By age group, 39 percent of respondents under 30 supported abolishing, compared to 33 percent opposed. But for every other age group, majorities oppose abolition, with more than 51 percent among 30 to 44-year-olds, and the rate only increasing from there. The news is especially bad for Democrats who hope to run on a platform of ICE abolition. Forty percent of respondents said that they would be less likely to vote for a candidate, while 34 percent said they were indifferent—just 26 percent would be more likely to back an ICE abolitionist. Forty percent of Democrats would be more likely to vote for a candidate backing abolition, while 21 would be less likely and 39 percent were indifferent. "[C]ongressional candidates who embrace the ‘Abolish ICE' movement could have a difficult time appealing to voters across party lines," said Tyler Sinclair, Morning Consult's managing director. Demographically, men were more likely to support keeping ICE—61 percent—than women—48 percent—but similar numbers supported abolition (more women were indifferent). 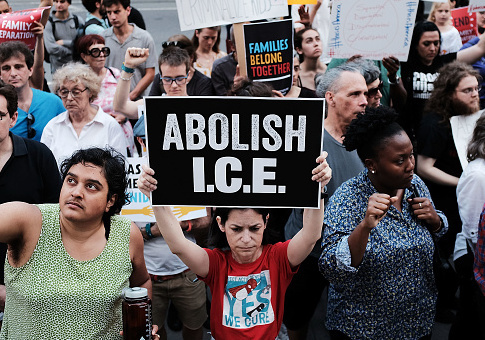 ICE abolition was most popular among Hispanic voters, with 46 percent supporting getting rid of the agency; by comparison, 22 percent of whites and 33 percent of blacks support abolition. Unsurprisingly, support for ICE was high among those who said they approved of how President Donald Trump is doing in office—78 percent wanted to keep it, while just 8 percent wanted to get rid of it. But even among those who said they disapproved of Trump's job performance, there was ambivalence: 41 percent wanted to abolish, 34 percent wanted to keep ICE, and 24 percent didn't know or were indifferent. Similarly, 42 percent of those who voted for Hillary Clinton in 2016 wanted to abolish ICE, 36 percent didn't, and 22 percent were indifferent or didn't know. This entry was posted in Politics and tagged 2018 Election, ICE, Immigration. Bookmark the permalink.